Title: POPE BENEDICT XVI ADVOCATES THE NEW WORLD ORDER IN HIS CHRISTMAS, 2005, SERMON! Subtitle: Benedict XVI joins Pope John Paul II in promoting the New World Order, but he did it in a public speech, during his 2005 Christmas sermon. This current Pope thus continues the trend set by Popes Paul VI and John Paul II in leading the drive to unite all world's religions into one so the New World Order Religion can be formed. We wondered how long it would take Pope Benedict XVI to actually and publicly advocate the New World Order. It did not take long. NEWS BRIEF: "Benedict XVI's Christmas Message: '"By Knocking at Our Door, God Challenges Us and Our Freedom' ", ZENIT - The World Seen From Rome, Code: ZE05122502, Date: 2005-12-25. "The modern age is often seen as an awakening of reason from its slumbers, humanity's enlightenment after an age of darkness. Yet without the light of Christ, the light of reason is not sufficient to enlighten humanity and the world. For this reason, the words of the Christmas Gospel: 'the true Light that enlightens every man was coming into this world' (John 1:9) resound now more than ever as a proclamation of salvation. 'It is only in the mystery of the Word made flesh that the mystery of humanity truly becomes clear' ("Gaudium et Spes," No. 22). The Church does not tire of repeating this message of hope reaffirmed by the Second Vatican Council, which concluded 40 years ago." "Men and women of today, humanity come of age yet often still so frail in mind and will, let the Child of Bethlehem take you by the hand! Do not fear; put your trust in him! The life-giving power of his light is an incentive for building a new world order based on just ethical and economic relationships. May his love guide every people on earth and strengthen their common consciousness of being a 'family' called to foster relationships of trust and mutual support. A united humanity will be able to confront the many troubling problems of the present time: from the menace of terrorism to the humiliating poverty in which millions of human beings live, from the proliferation of weapons to the pandemics and the environmental destruction which threatens the future of our planet." This new Pope actually used the term, "New World Order" in his speech, thus aligning himself and his global Catholic Church with other leaders of the Illuminati which are straining as much politically and/or economically as the Vatican is straining religiously to unite the world globally in these three spheres. Until this global unity is achieved, Antichrist cannot appear. The wording of this prophecy tells us that the final 10 kings of the earth (which was formed from 12/31/1992 to the end of 1996) shall "surrender" their power and authority to the Beast. Now, no one can surrender something they do not already possess. Therefore, the implication is powerful and sure, that Antichrist cannot arise until the final 10 kings first globalize the world -- politically, economically, and religiously -- so they can hand that collective power and authority over to Antichrist once he is on the world scene. And, of course, we know from Jesus' Words that Antichrist will arise from the "Final Birth Pangs" war, which the Illuminati calls World War III. Therefore, we believe this planned World War III shall provide the final impetus which will propel the world into the global kingdom known as the New World Order; in other words, this Third World War will finally globalize each of the three spheres listed above and will finally deliver full authority to the existing 10 kings (NEWS1167 and NEWS1002). At that point, Antichrist (the Beast) will receive the collective power and authority of these 10 rulers. If Antichrist arises prior to January 20, 2009, President George W. Bush will represent NAFTA at the podium where Antichrist will receive this collective global authority. Before we go on, we need to state that, yes, Pope Benedict dressed up as Santa Claus to give his Christmas speech. You can read the whole story: "Pope looked like Santa Claus". We can see that the Roman Catholic Church seems to have adopted the type of Savior as the rest of the world bows down to every Christmas. Read our article as to how Santa has replaced Jesus -- NEWS1132. August 18, 1991, the Illuminati has decided that the Roman Catholic Pope -- whomever he will be at the time -- will be the top religious leader of the newly formed global religion which was called the "New World Order Religion" on August 18, 1991 (Read NEWS1052 for full details). This information brings us back to the current Pope, Benedict XVI. We are not sure that he will be Pope at this time, but he certainly is following the path set by his Illuminati predecessors, Pope Paul VI and Pope John Paul II in promoting global religious unity demanded by the New World Order. Furthermore, as we pointed out in NEWS2029, Pope Benedict XVI signaled his occult intentions to follow the New World Order path set out by Pope John Paul II when he flashed forth the "Twisted Cross Crucifix" the Illuminati symbol for their coming Black Magick Masonic Christ. But, why should we be too surprised, for Benedict's signals to the world are consistent with the "Grand Global Merger of Black Magick Forces" which initially occurred in June, 1963. Let us examine that most important event now. 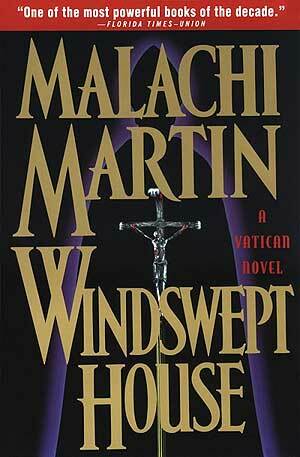 SETTING THE STAGE: "Windswept House: A Vatican Novel", by Malachi Martin, "The Enthronement of the Fallen Archangel Lucifer, June 29, 1963. This Pope who would take the name of the Apostle Paul, was none other than Pope Paul VI, who became Pope on June 21, 1963. Few people know that, on that day, a grand merger of Satanic forces occurred that brought the Vatican into full accord with the Masters of the Illuminati. You see, Satanists know that the Traditional Roman Catholic Church has always been the most powerful practitioner of White Magic Witchcraft in the world [Read NEWS1334 for full details], while the Masters of the Illuminati has been the most powerful practitioner of Black Magick Witchcraft in the world since their founding on May 1, 1776. As a result, the Vatican and the Masters of the Illuminati had always been mortal enemies on the global stage. Was the world to be united under a global government controlled by the White Magic Vatican or by the Black Magick Illuminati? Vatican intrigue and subversion of governments worldwide continually clashed with similar intrigue by the Black Magic Illuminati. The conflict was the stuff of legends, the stuff of the CIA battling the KGB. Fierce Countenance -- since a Black Magick witch or wizard has voluntarily given themselves up to the Dark Side, to the Dark demonic forces of Hell, they are filled with an anger and hatred that is truly supernatural. They will physically take on a dark, brooding look. Adolf Hitler is the most infamous example in world history, and pictures of him abound showing him very dark, very brooding. Freemason Aleister Crowley is another good example. Understanding Dark Sentences -- When any occultist reaches a certain point in the development of his or her understanding of Witchcraft, they must make a choice: if they choose to use their occult power for "good", they are said to be following the Right Hand Path, and practicing White Magic. If they choose to use their occult power for "evil", they are said to be following the Left Hand Path, and practicing Black Magick Witchcraft. A Black Magick Witch or Wizard then practices "Dark Sentences" that wreak chaos, death, and destruction. A good example of this type of Dark Sentence is a "killing curse", where a demon is called into this dimension for the express purpose of killing an enemy of the coven; police departments are well aware of this type of "Dark Sentence", and they call it Psychic Murder. Such murder is impossible to solve because no human carried out the deed; since a supernatural demon carried out the murder, no clues are left behind which would enable police to solve the crime. Craft to Prosper in his Hand -- Witchcraft has always been referred to in a shorthand way as "The Craft". Further, all rituals are done by the witch or wizard using their hands. The movement of the hands ceremonially is crucial to the success of the ritual of whatever kind it is. This Bent Crucifix is "... a sinister symbol, used by Satanists in the sixth century, that had been revived at the time of Vatican Two. This was a bent or broken cross, on which was displayed a repulsive and distorted figure of Christ, which the black magicians and sorcerers of the Middle Ages had made use of to represent the Biblical term 'Mark of the Beast'. Yet, not only Paul VI, but his successors, the two John-Pauls, carried that object and held it up to be revered by crowds, who had not the slightest idea that it stood for anti-Christ." (p. 72) On page 56 Compton prints a picture of the current Pope, John Paul II, holding this bent or broken cross, just as we have shown, at left. We encourage you to read the full report on this subject in RC100. The Twisted Cross is very well known as a symbol of the Black Magick Antichrist to Satanists throughout the world. Further, Satanists around the world know the role of the Papacy in promoting this Black Magick plan. This fact is the reason Malachi Martin showed the Twisted Crucifix on the front cover of his novel, "Windswept House"; this Twisted Crucifix is displayed prominently against the black-clad figure of the Pope in the background! However, each gesture, each word, of the ceremony in the Roman Chapel within the Vatican must be exactly, simultaneously carried out in the off-site chapel. To accomplish this feat, a telephone hookup was established. In each location, a senior priest who had carried out the ritual so any times they were perfectly familiar with the cadence of the gesture and the spoken word would begin at the same moment, and end at precisely the same moment. When the time came for the "living sacrifice" to be made, the ceremonial dagger in the Vatican would fall at precisely the same moment as the ceremonial dagger in the off-site chapel! Through this Black Magick ceremony, the first truly Black Magick Pope in history -- Pope Paul VI -- was officially and powerfully enthroned. The Parallel Ceremony was absolutely essential, for the true merger of Satanic forces worldwide could not have otherwise occurred. But, occur they did. The massive Satanic forces of Black and White Magic ceased their battling for supremacy, joining forces at the "Latter Time" in order to finally move the world into the Kingdom of Antichrist, the New World Order. From that moment, final decisions were made by the top leadership of the Masters of the Illuminati, not the Vatican. The top leadership shifted to the British Monarchy, to the House of Windsor [Read "Antichrist and a Cup of Tea", by Tim Cohen]; the Vatican simply began to take orders instead of issue them. This grand merger of all Satanic forces meant that the Jesuits were now working for the Illuminati, not for the Vatican. All the agents of the Jesuits, and all their organizations, now took their orders from the Illuminati. Therefore, all events that occurred on behalf of the coming New World Order after June 29, 1963, occurred because the Illuminati ordered it. The Vatican ceased to be an independent headquarters, and began marching in full sync with the House of Windsor. The Pope was then chosen to be the top religious leader in early 1991 [Read NEWS1052 for full details]. Since the Illuminati is fully in control of the Vatican now, and since they plan on the Pope being the Religious False Prophet of Revelation 13:11-18 they have no trouble showing public obeisance to the Pope when they meet with him; thus, the Pope wears the white dress symbolic in the Zoroastrian religion of the Luciferian Sun God, while the Illuminists who meet with him dress in subordinate black [Read NEWS1608]. This fact is the one key element that the author of the Vatican Assassins simply does not understand. Nevertheless, his expose' of the Vatican and the Jesuits is priceless, for they thoroughly document the Jesuit intrigue from the long corridors of history and into the 20th Century. They also aid us in understanding many of the troubling events of history. Let us now examine just such a troubling event: the assassination of President John F. Kennedy. Let us review the Vatican Assassins revelations first. Head, W.R. Grace & Co.
"Spelly's War" in Vietnam, and therefore was a "notorious tyrant"
in his Defensio Catholicae Fidei. Francis Cardinal Spellman, Archbishop of New York and the Knights of Columbus. Vatican Assassins reveals that he is also the "Military Vicar" for America. Few people have ever thought the Cardinal had a "dark side" to him, but he assuredly does, for no one not part of the Black Pope agenda could ever be appointed to such a high level of authority within the Roman Catholic hierarchy. J. Peter Grace, Head of the American branch of the Knights of Malta. Grace was also appointed to a special investigative panel by President Reagan. John A. McCone, Knight of Malta, and CFR [Council on Foreign Relations] member, was well known throughout the disastrous Vietnam War, one of the major planned wars of the Illuminati. William F. Buckley, Jr., Knight of Malta, CFR and CIA, plus the Satanic secret society, Skull and Bones [Read NEWS1314]. Buckley has always been touted as a key "Conservative" that fights Big Government and its ever-increasing intrusiveness, demonstrating the truth we teach in Seminar 2, that the CFR was designed to turn out men and women thoroughly trained in the tactics of the New World Order, while graduating with a label they would carry with them for the rest of their lives. Lee Harvey Oswald was a low-level CIA/KGB agent who was used mightily to foster the ridiculous one-gunman theory of the assassination of President Kennedy. Any well-laid assassination will always have a fall-guy to whom the focus of the "investigation" can turn, thus drawing the attention of the average citizen away from the real culprits. But, the government lied, did it not, in telling the whole world that Oswald was the lone shooter! One can never trust the government, no matter who is the President at the time. Gerald Ford, designated to become President after Nixon resigned, was not only a Shriner Freemason as reported by Vatican Assassins, but was also a member of the Bilderberg Group, one of the major Illuminist governing bodies. Charles Colson is identified by Vatican Assassins as a "Pro-Jesuit Protestant"! This certainly explains the terribly wrong turn that Colson's ministry took, as he veered off into horrific apostasy, cooperating with the Pope, accepting the Templeton Award and generally leading trusting Christians astray! I correctly identifies the reason President Kennedy was murdered: he was going to take America out of the planned Vietnam War. Further, Kennedy planned to drastically reduce the power and scope of the CIA and the Federal Reserve, and some have even stated their belief that he was going to reveal the total plan of the Illuminati to stage Antichrist! It is no wonder the Jesuits took him out! Earl Warren, head of the Warren Commission. Now you know how this commission could white-wash the Kennedy Assassination so completely, and issue the physics-defying official conclusion that Lee Harvey Oswald was solely responsible for the murder of our President. J. Edgar Hoover, a 33rd Degree Mason. Further, Kennedy was shot in the exact location in which the legendary hero, Hiram Abiff, was struck by the three ruffians in the dramatic legend of the Masonic Lodge! As was Hiram Abiff, Kennedy was struck in the back near the area of the heart, the neck, and finally the head. The last blow killed both men. Finally, the Illuminati signaled to the entire world that they were the force behind the assassination when they created the Eternal Flame monument to the slain President [Read NEWS1547 for full details]. Freemasonry thus has its fingerprints all over the Kennedy assassination! Now, how can both the White Magic Jesuits and the Black Magick Masons be intimately involved in the leadership of the assassination of President Kennedy? One cannot possibly reconcile this question unless you understand that a grand merger of all Satanic forces occurred on June 29, 1963, at the secret Enthronement of Pope Paul VI! The organizations set up by the Jesuits became the organizations of the Masters of the Illuminati on June 29, 1963. We are now fully 39 years following that eventful, secret Enthronement of the Fallen Archangel Lucifer, as described by Malachi Martin. World events have proceeded apace, and now the world stands trembling at the precipice the Bible calls the Tribulational Period, and its ruler, Antichrist. Truly, the End of the Age is upon the entire world.